The Allianz League Division 3 clash between Derry and Offaly could not go ahead due to snow. 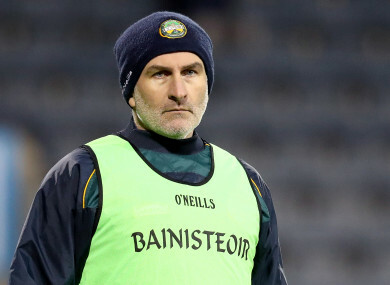 OFFALY FOOTBALL BOSS Stephen Wallace has hit out at the late cancellation of his side’s scheduled Allianz League Division 3 clash in Derry on Sunday. The fixture which was scheduled for 12.45 was called off 75 minutes ahead of the throw-in, due to the snowy conditions on the pitch. A number of other Allianz League matches were unable to go ahead as a result of the weather, and are expected to be rescheduled by the CCCC on Monday. Wallace believes the decision to postpone their game should have been made earlier in the interests of the Offaly team and supporters, who made the long journey to Celtic Park for the clash. “Bit of a disaster for the lads, we were geared up to play. [It] looked doubtful from early this morning. To come all the way to the ground and be told to turn around and go home is a bit disappointing. “It could have been called a little earlier but it is what it is. “Supporters coming up the road from Offaly for the game and they have to turn around and go home again in dangerous driving conditions. I think possibly we need to look at this and call these things a lot earlier. That is fit for nothing only making snowmen, and there is more snow coming. We will be back up to lovely Derry next Sunday and hopefully it goes ahead next Sunday. “Lots of games were called earlier. Games were coming through on social media all morning as cancelled. We’re here in Celtic Park ready to go and find out the game isn’t going ahead. Email “'That is fit for nothing only making snowmen': Offaly boss fumes at late match cancellation ”. Feedback on “'That is fit for nothing only making snowmen': Offaly boss fumes at late match cancellation ”.